Military action dominates today’s thrillers, but diplomacy can generate even more tension and suspense. If you need proof, read Todd Moss’s hyper-realistic and high-powered debut thriller, THE GOLDEN HOUR. The novel revolves around a sudden crisis in Africa. A coup d’état in Mali overthrows the president and the State Department is counting on its new experimental Crisis Reaction Unit to handle the situation. The unit is the brainchild of Judd Ryker, who recently left academia to test his theories in the real world of international diplomacy. Ryker is not the typical gun-wielding thriller hero. He’s a soft-spoken professor who finds being chief of the Crisis Reaction Unit a major challenge. Of course, the challenges mount quickly. A senator’s daughter is kidnapped in Timbuktu. A violent new Jihadist cell rises in the desert. The American embassy is at risk of a terrorist attack. And Ryker has just one-hundred hours to set it all right again. Arthur Kerns comes to the business of writing novels after a long career in the FBI and intelligence community. So was he a spy? 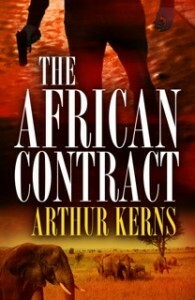 His latest novel, THE AFRICAN CONTRACT, is set in many countries where Kerns has worked, including Liberia, Sierra Leone, Cameroon, and South Africa. Kerns said Africa has always pulled at him. “Years ago, Ernest Hemingway and Jack Kerouac were pop stars,” Kerns said. “I wanted to join in on the African safaris, Spanish bullfights, and of course go ‘on the road.’ When I tried writing I found I didn’t have the skills or the ideas to write a good story. In his latest novel, the action for hero Hayden Stone starts with a mysterious boxcar sitting, locked, in the wilds of Namibia—with people who would kill to obtain it or die if what’s inside gets put to use. Hayden travels through slums, mansions, and the shadowy world of black ops, unable to trust any of the players. Jason Bourne has a new identity. 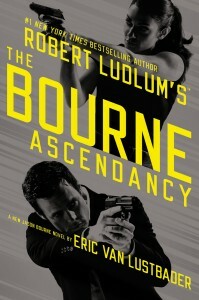 That is, he’s asked to take on an all-new persona in his newest adventure, ROBERT LUDLUM’S (TM) THE BOURNE ASCENDANCY by Eric Van Lustbader. As part of the job, Bourne is given the impossible task of impersonating the official he’s defending at a political summit meeting in Qatar. The impersonation works well, until gunmen storm the summit and kill all on the scene. Everyone except Bourne, who quickly discovers it’s not the minister who’s the target. Kidnapped, he’s transported to the underground bunker of an infamous terrorist named El Ghadan (“Tomorrow”). El Ghadan holds Soraya Moore—former co-director of Treadstone, and a close friend to Bourne—as his captive along with her two year old daughter. Meanwhile, the President of the United States is in the midst of brokering a historic peace treaty between the Israelis and the Palestinians—an event that El Ghadan is desperate to prevent. He demands that Bourne carry out a special mission: kill the President and if Bourne refuses, Soraya and her daughter will die. Bourne must make a monstrous choice: save Soraya and her daughter, or save the President of the United States. It’s not a change of pace, which is still frenetic, but it is a bit of a new direction for the former intelligence operative Bourne from the black ops program Treadstone. He was introduced in Ludlum’s THE BOURNE IDENTITY (1980) as an amnesiac whose formidable skills emerge in a fight and flight for survival. 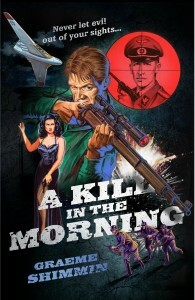 A new twist on history awaits in Graeme Shimmin’s new novel, A KILL IN THE MORNING. The year is 1955 and something is very wrong with the world. It is fourteen years since Churchill died and the World War II ended. In occupied Europe, Britain fights a cold war against a nuclear-armed Nazi Germany. Into this arena steps a nameless British assassin, on the run from a sinister cabal within his own government, and planning a private war against the Nazis. And now the fate of the world rests on a single kill in the morning. THE BIG THRILL recently got in touch with Graeme to discuss his process and what he has in store for us next. A KILL IN THE MORNING re-imagines the World War II / Cold War eras and gives us a world where the Nazi regime still exists in the 1950s. What excited you about this idea and how does it differ from other stories that may have tried a similar approach? What excited me about writing A KILL IN THE MORNING, was an image I’d had in my head for years of hanger doors grinding open to reveal an amazing super-weapon that I could never quite see. I also had inspiration from all the classic spy novels I’d read. When I started writing, all those ideas just seemed to flood out. About half-way through, I suddenly realized how it had to end and that it was really going to work. I sat back and just thought that “this is the story I was born to write.” It was an amazing moment. I felt like a sculptor, chipping away and finding the sculpture was already there inside the marble. 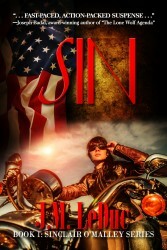 THE BIG THRILL recently caught up with J.M LeDuc who graciously agreed to answer some questions about his compelling new novel, SIN. SIN is quite a departure from your other books. Tell us why you decided to go in another direction? Interesting question. My previous books, the TRILOGY OF THE CHOSEN and CORNERSTONE, all part of the Phantom Squad Series have been categorized as Inspirational Thrillers. To be honest, I never set out to place faith in my writing. It just happened. My writing is very organic and that’s what developed. Once it did, it seemed right, so the inspiration / faith factor stayed. With SIN, I felt a different pull. I wanted to write a female protagonist who matched the story. At the center of SIN is the world of human trafficking—a gritty, dirty business that is rampant worldwide, including the United States. Sinclair O’Malley was the right protagonist for the series. She is bold with a take-no-prisoners attitude. Although she lacks a filter, her heart is in the right place. So, to answer your question, I wanted to match the tone of the character with the tone of the subject. You mentioned wanting to write a female protagonist. As a male writer, what challenges did that bring? At the beginning of the process, it seemed like it would be easy. I drew on the strong women I have known and the ones in my own life. 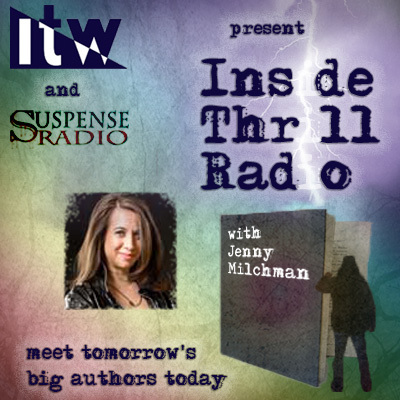 With the help of Shannon Raab at Suspense Publishing, I soon found out it wasn’t quite so easy after all. She helped me tread that fine line between attitude and testosterone. Make no mistake, Sin is all female. She just fires on all cylinders at all times. She was tough to reign in, but I think with the help of Shannon and others, I found that delicate balance. In the end, the readers will let me know. 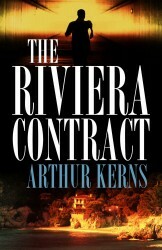 When Diversion Books, Inc. published my debut novel, THE RIVIERA CONTRACT, the event signaled a milestone in my career, or should I say careers. After serving twenty-four years with the FBI I embarked on a twenty-year quest to have a novel of mine appear in print. While learning the craft of writing, I traveled to over sixty-five countries as a security consultant for US diplomatic establishments throughout the world. These travels are reflected in my novel, an espionage thriller set in France and the French Riviera. Although writing for the high school newspaper was fun, I knew then fiction was my goal, but for a long time I really didn’t have anything to say. After college and three years in the Navy, I joined the FBI, spending most of my career in counterintelligence and counterterrorism. Following retirement from the FBI, foreign travel as a consultant opened my eyes to new worlds. Some countries I visited were off-limits to tourists and mainstream travelers. After work, in some exotic country, I’d record my impressions in a journal. Those journals have proven good resources for my current novel and especially its sequel, THE AFRICAN CONTRACT, both featuring the CIA operative, Hayden Stone, who combats international terrorists and occasionally romances beautiful women. 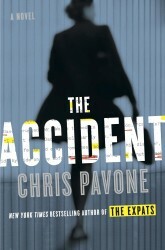 Chris Pavone, NEW YORK TIMES bestselling author, is a man of intrigue. I suppose you could call him a renaissance man, although, man of intrigue does roll off the tongue nicely. He’s a New Yorker at heart, who attended Cornell and later worked for various publishing houses, at one, he even specialized in cookbooks. Before his journey into fiction, he wrote a small wine journal called THE WINE LOG. Chris then spent time with his wife and two kids in Luxemburg as an expat and used the time well, writing his blockbuster debut novel, THE EXPATS. In March, he releases his exciting follow-up, THE ACCIDENT. It’s a tale about a literary agent drawn into a complex web of betrayals over a mysterious manuscript detailing dangerous information that proves to be deadly. Tell us about THE ACCIDENT. We’re all curious (and excited!) to know what to expect as a follow-up to THE EXPATS. A literary agent named Isabel Reed receives an anonymous manuscript, revealing dangerous secrets about a powerful man—and then people start dying. Isabel is drawn into a complex web of betrayals among media figures in New York, Washington, and Los Angeles, plus a couple of spies in Copenhagen (characters who appeared in THE EXPATS!) as well as the author in Zurich, with interrelated back stories in Paris, London, and a winding country road in upstate New York, long ago and late at night, which is the scene of the eponymous accident. What made you pick up a pen and start writing? I’ve always wanted to, and at age forty I had an unusual experience that (a) I thought would make the basis for a decent book, and (b) gave me the time to write. So, it was time to give it a try. Brad Thor named Marc Cameron “one of the hottest new authors in the thriller genre” and called his new book “an engrossing, non-stop tale of action, deceit and international intrigue.” With TIME OF ATTACK—the fourth book in the Jericho Quinn series—Marc Cameron has raised the stakes yet again for Quinn and the world. Tell us about TIME OF ATTACK in one line. TIME OF ATTACK follows Jericho Quinn moments after STATE OF EMERGENCY ends, with the release of a deadly plague and the snap of a sniper’s trigger. This is the third book in the series, set in a part of the world few Americans have heard about. What inspired you to have the character assigned to the Azerbaijan and Kyrgyzstan region? The long, sensible answer would require me to offer up caffeine injections as a courtesy to readers, so here’s the somewhat-incomprehensible short version: an interest in history and international relations led me to Iran; Iran led me to Azerbaijan (they share a border and majority religion); and Azerbaijan led me to Kyrgyzstan (Azeri and Kyrgyz are both Turkic languages). That and I love to explore. You seem to rip your plots right out of the newspaper headlines. How do you keep from getting too close to real events, while still keeping it realistic? I don’t worry about getting too close to real events. Adrian Magson recently told THE BIG THRILL about how his new novel, THE WATCHMAN came about. About eighteen months ago, at a lunch meeting with my publishers, and agent, David Headley, I was asked if I’d ever thought of writing a character to alternate with my main one, ex-MI5 officer, Harry Tate (RED STATION, TRACERS, RETRIBUTION, and DECEPTION, with the fifth, EXECUTION, on the boil). “Of course I have – and could,” I said, fingers crossed beneath the table. Well, in these uncertain times, it pays to be positive. Besides, I like a challenge. I’d also written three books in the Inspector Lucas Rocco crime series set in France in the 1960s (DEATH ON THE MARAIS, DEATH ON THE RIVE NORD, and DEATH ON THE PONT NOIR published by Allison & Busby), and was into the fourth, DEATH AT THE CLOS DU LAC, so perhaps sensed it was time for a change. The change became a desire to try something darker, with more edge, yet still with the up-to-the-minute themes that I’ve used in the Harry Tates. Unfortunately, everything changes when an undercover Department of Defense investigator named Diana Dawkins comes crashing into his life. 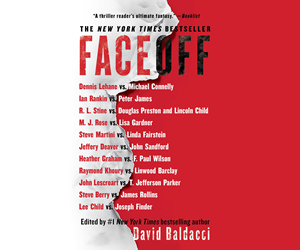 Diana tells Colt he has been recruited into The Circle, a super-secret organization charged with protecting the country from a variety of threats, foreign and domestic. Diana needs Colt’s help, and she’s willing to pay him well for it. Suddenly, Colt finds himself a key player in an elaborate effort to defend the president of the United States against an assassination attempt. His hush-hush missions for Diana and The Circle are becoming increasingly surreal—and deadly. Colt realizes he could lose everything, even the wife he loves. Will he be able to stop the terrorists in time? And at what cost? 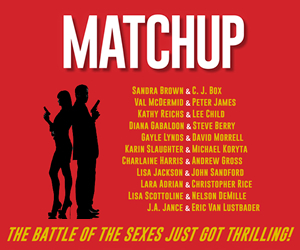 Valerie Plame, whose own career as an undercover CIA agent was effectively ended when her cover was blown by several members of the George W. Bush Administration in 2003, has collaborated with seasoned suspense author Sarah Lovett (the Sarah Strange series) to write the first of a series of thrillers focusing on a female CIA agent, Vanessa Pierson. Andrew Kaplan is best known as the author of two spy thriller book series: SCORPION and HOMELAND. A former journalist, war correspondent and businessman, he covered events around the world and served in both the U.S. Army and the Israeli Army. The CIA has tried on a number of occasions to recruit him and he has consulted with think tanks that advise governments. He is the author of eight international bestselling novels, including DRAGONFIRE and WAR OF THE RAVEN in addition to the SCORPION and HOMELAND series and his works have been translated into twenty languages. Recently three of Amazon’s top 20 thrillers were his SCORPION books. His film-writing career includes the James Bond classic, GOLDENEYE. He is the author of the highly anticipated, HOMELAND: CARRIE’S RUN, an original prequel novel based on the award-winning hit television series, HOMELAND and is currently working on the next book in the HOMELAND series. In this original prequel novel to Showtime’s award-winning hit series HOMELAND–“the best thriller on American television” (NEW YORK POST)–CIA Intelligence Officer Carrie Mathison is sent on a mission to Beirut and Iraq that will radically transform the course of her career and her life. Maloney explained that sharing his stories with others gave his daughter what she needed, “Last September, when I had my book launch for TERMINATION ORDERS (Maloney’s debut novel), I read a chapter from it, then there was a Q&A session. People were asking me things that she never asked me. All of a sudden, she put her sunglasses on. Then, every once in a while, she’d take her hand and bring it up under her eye. In his first novel, Maloney introduced us to Dan Morgan a Black Operative that this very much Maloney, maybe with fewer grey hairs. In Maloney’s second novel, which launched August 27, 2013, Dan Morgan is back in SILENT ASSASSIN. This time, Morgan is pulled in when every other option has failed. His mission is to find Nikolai Novokoff, a ruthless KGB officer turned international arms dealer. He will locate the weapons of mass destruction the rogue terrorist is threatening to unleash on the world, and terminate with extreme prejudice. The exciting sequel to A BODYGUARD OF LIES! These are two of the choices FBI analyst/undercover specialist Jake Bernstein faces when he goes undercover for the Joint Counter Terrorism Center. His mission in Silicon Valley: Identify the masterminds behind what the JCTC chief believes is a coordinated terrorist plot that may involve five American cities. Posing as a disaffected biotech scientist, Jake is recruited and tested in a harsh, brutal way. But slowly, the pieces of a terrorist plot begin to emerge. To prove his loyalty to radical Islam, he must first pass the ultimate test of total obedience. It is a test so despicable and shocking, Jake doubts he can follow through with it. But if he cannot do this, the undercover operation will fail. Thousands of lives are at stake! As the cell lies in wait for the final call to carry out mass murder, Jake must make a fateful choice. Do his duty and stop the terrorist plot? Or save the woman he loves? Is Jake clever enough to do both? Australian author, James Phelan, gives us another dose of heart-pounding, ripped-from-the-headlines action in BLOOD OIL featuring the investigative journalist and ex-special operations navy diver, Lachlan Fox. Oil prices are rocketing. Terror attacks have destabilized the global economy. The White House believes the Nigerian oil fields are the key to safeguarding America’s future…but someone else sees them as an opportunity to increase their own power. Traveling from New York to Nigeria, investigative journalist and ex-navy operative Lachlan Fox is hunting the story. He’s seen combat action before but this time it’s personal. Wrestling with demons that push him right to the edge and leave him exposed like never before, will Fox uncover the truth in time? Or will his quest for revenge see him go too far? Andrew Kaplan is a former journalist and war correspondent covering events around the world. He served in both the U.S. Army and in the Israeli Army during the Six Day War and worked in military intelligence. The CIA has tried on several occasions to recruit him. He has consulted with groups that advise governments and as president of a technical communications company worked on a contract basis with a number of leading U.S. corporations and government agencies. He is the author of several international best-selling novels including HOUR OF THE ASSASSINS, DRAGONFIRE, and WAR OF THE RAVEN, though he is best-known as author of the Scorpion series. His latest novel is the stunning SCORPION DECEPTION, coming this June from Harper Collins. Scorpion is an American ex-CIA agent turned independent intelligence contractor. He is hired for missions – often the most difficult – by organizations like the CIA. His code-name, “Scorpion,” is derived from an incident in his childhood in Arabia. Although there’s plenty of action, unlike the Mitch Rapp/Scott Horvath types, Scorpion is a loner whose missions have more to do with real international espionage than the slam-bang stuff. Agencies have to think twice before they hire him because he’s a man with his own moral code; a knife that can cut both ways. Tell us about SCORPION DECEPTION. A brutal hit squad attacks the U.S. embassy in Switzerland (written before Benghazi), stealing highly classified CIA files and leaving no one alive. There are no clues to their identity. Congressional leaders demand military action and the CIA turns to Scorpion. But Scorpion is unwilling to get involved . . . until he learns his name is at the top of the stolen list. The story rockets from the refugee camps of Africa and across Europe to Tehran’s ruling inner circles. With war hanging in the balance, Scorpion must survive a manhunt while trying to outwit a brilliant spymaster known only as “the Gardener”. Thom Carlyle had it all: the rowing trophies, the Oxbridge education, the glamorous girlfriend. But on a glorious summer evening in Harvard Square, Thom is murdered—pushed from the top of a Harvard bell tower. The New England Chronicle sends a beautiful, feisty, but troubled reporter named Alexandra James to investigate. It is the story of a lifetime. But it is not what it seems. Alex’s reporting takes her abroad, from the cobbled courtyards of Cambridge, England…to the inside of a network of nuclear terrorists…to the corridors of the CIA…and finally, to the terrorists’ target itself. Mary Louise Kelly’s debut novel, ANONYMOUS SOURCES, is available soon, and she’s graciously agreed to tell us about it. Tell us a bit about your new release, ANONYMOUS SOURCES. 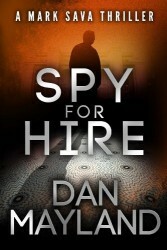 It’s a spy thriller, complete with assassins, double-agents and terrorists. But it doesn’t take itself too seriously. There are scenes that some of my early readers say had them doubled over in laughter. My protagonist, Alexandra James, really carries the story. She’s a fascinating mix of sass and vulnerability. André Breton once described one of Frida Kahlo’s paintings as “a ribbon around a bomb.” That pretty much sums up Alex James. How much research goes into a story like ANONYMOUS SOURCES? A surprising amount, actually. Given that it’s fiction, you would think you could just make everything up. But – perhaps because of my training as a reporter – I was obsessed with getting the details right. I visited every setting described in the book personally, from the Eliot House bell tower at Harvard, to the room where they serve tea at Claridge’s Hotel, to CIA headquarters. What if Alexander Litvinenko, the former Russian FSB officer allegedly murdered by polonium 210 poisoning in London in 2006 on the orders of Moscow, wasn’t the intended – or only target? As with all my books, whether this, the Harry Tate spy series, the Inspector Lucas Rocco police series (set in France in the 1960s), or the Gavin & Palmer series set in London, I like to use real events as a jumping-off point for the storyline. For EXECUTION, I had picked up on recently renewed demands by Litvinenko’s family for a detailed investigation into his murder, and proof that it was the FSB and Moscow involved. I found myself thinking about what might have happened if it turned out that Litvinenko wasn’t the only victim to be targeted. In the grand tradition of unforgettable Cold War spy thrillers, Bill Moody’s THE MAN IN RED SQUARE sends you on an exciting journey into history, politics, and deception as Washington and Moscow jockey to pull off a critical spy exchange in 1980. When America defector Robert Owens passes a note to his former colleague in Moscow’s Red Square saying he wants to come home, American intelligence is faced with a major dilemma. To ensure they are getting the genuine article and not an impostor, they must find someone who can ask questions only the real Owens can answer. CIA veteran Charles Fox’s search turns up Christopher Storm, a teacher who served with Owens in Vietnam. Storm accepts the assignment as plans are made to exchange Owens for a Soviet trade official. But Storm isn’t told the whole story. When he meets with Owens, he discovers even more deception and the KGB’s complicated compartmentalization threatens to unravel the entire affair. Storm is forced into a desperate escape plan which may be the only way out. Ex-MI5 Harry Tate is back. “Harry. Plse make Grosvenor Square tomorrow 18.30. Urgent. Remember Mirovica.” An atrocity that allegedly took place under Harry’s watch in Kosovo in 1999 returns to haunt him when he receives a summons from an old UN contact. A lone assassin is tracking down all those who were present that fateful night, despatching his victims with cold, skilful efficiency. Who is he and why does he want revenge? If he is to uncover the identity of this ruthless killer and stay alive in the process, Harry must uncover what really happened in Mirovica back in 1999. With PANDORA’S TEMPLE, Jon Land brings back his hero Blaine McCracken. We haven’t heard from McCracken since 1998 in DEAD SIMPLE when we left him in the swamps of Florida with his mentor and friend Buck Torrey. I am happy to say that PANDORA’S TEMPLE was like getting together with a good friend. You know the kind I mean – you don’t see one another for years and pick up right where you left off. That’s the feeling I had welcoming back Blaine McCracken. PANDORA’S TEMPLE begins with the aftermath of a deepwater oilrig disaster that claims the life of a friend and one-time member of McCracken’s commando unit. An investigation of what remains leads to the conclusion that one of the most dangerous and elusive elements in the universe, dark matter, is to blame. Oh yes, McCracken is back! For Albert Ashforth the impetus for setting THE RENDITION in Kosovo dates back to 1389. The 1400s is not exactly the time frame one would expect for a novel set in 2008, yet history backs up Al’s assertion on the importance of this date. In the that year, 1389, Kosovo lost it’s freedom as a nation and became part of the Ottoman Empire. Eventually the Ottomans lost control of the Balkan part and ceded Kosovo to Serbia. Serbia and Kosovo differ culturally and the relationship was never easy. Then as Yugoslavia began to fall apart, Kosovars began to realize their 600-year-old dream of independence. Kosovo was recognized as an independent nation in February 2008. And it is here in these tumultuous times we find THE RENDITION.